I know it’s been a long time since I wrote for your entertainment but when I have time to write I tend to be tempted to just play instead. However, with Geld now writing for TORWars.com as well as here I thought I would try to pick up writing again. Since I last wrote, I have been busy. I have leveled my shadow up to level 50 and have a few pieces of Battlemaster gear. It was a blast. I know most people say the consular story isn’t very good (esp. chapter one) but I actually enjoyed it. I particularly was into chapter one. It was my favorite in spite of the critics. I will forever wear my Bar’senthor title. Moving on, I am taking a stroll on the dark side. 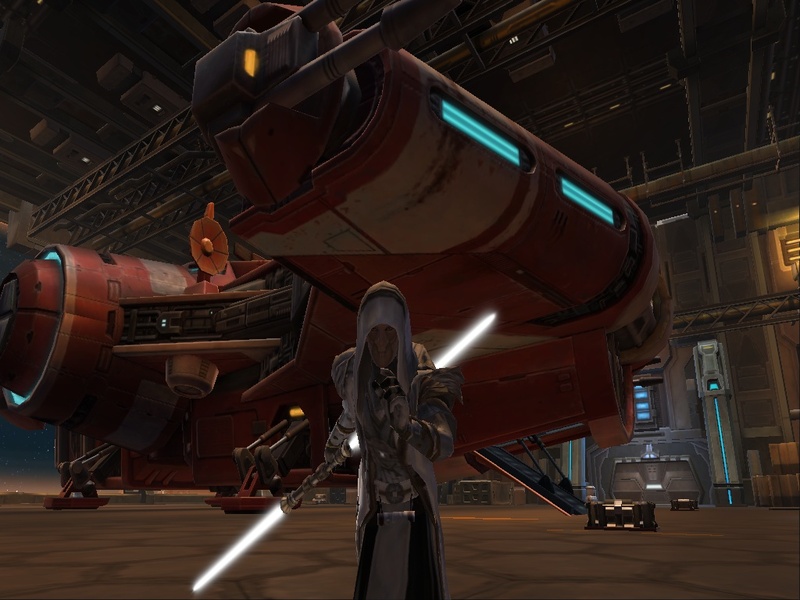 My next character to level up will be my Sith Warrior. I really like the imagery of it brings up. The dark foreboding lord of the sith tends to suit my personality well…though it doesn’t match my stature. (I’m only about 5’6’’) I tend to the dark side more anyways. My shadow was grey and my warrior will likely be the same. I prefer to play with the light/dark side choice indicator off so I can pick the way I want and am not swayed by a particular alignment. Another reason I choose the warrior is because I used to play a death knight as my main in WoW. I feel the two personas go together and I really enjoyed the melee playstyle. What little Role Playing I actually do. I tend to the fallen warrior trying to redeem himself. That was the story behind my Death Knight and that’s how I will play my Sith Warrior. I of course will begin pure dark and completely loyal to the Empire then I will slowly turn to see that there is a better way to go. One day, I plan to actually write out my legacy RP for you, but that will take awhile. 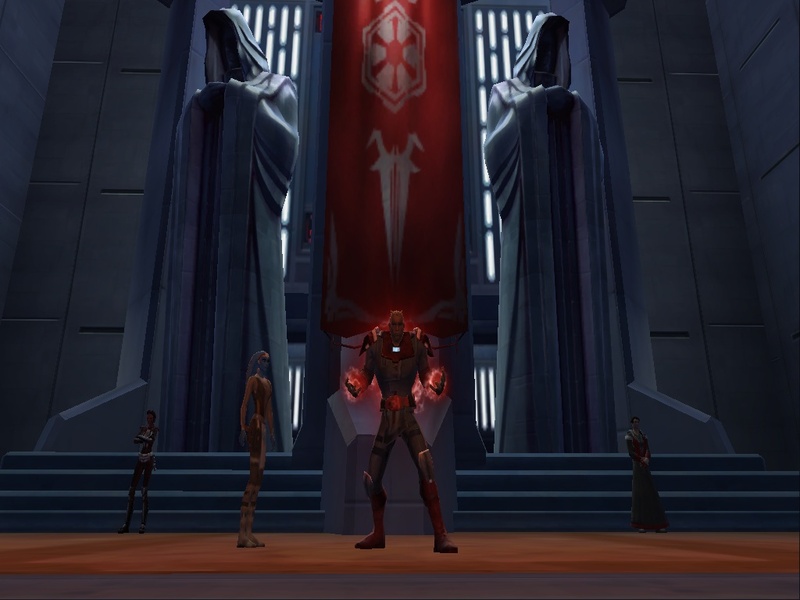 This is to be the beginning of a running series about my journey I take while leveling a Sith Warrior. Here I will express my joys, frustrations, tips, tricks and the like for your enjoyment. It will also be my endeavor to keep my post absolutely spoiler free. I can’t stand them so I won’t write them. This article will center around my experience on Korriban. I really enjoyed the story there and it was very refreshing compared to the republic side. I find the voice acting to be superb and the story terrific. I progressed too fast and had my last quest for my story on Korriban which is rated to be about level 11 and I was only level 7. (sad face) So I was forced to do the thing I hated so much about WoW. I had to grind. Luckily, it wasn’t so bad and it went really quickly. Once I hit level nine I decided to try out the last quest. …almost. I have the avid fascination with datacrons. I think they are so cool and I love collecting them, even at the expense of getting more leveling done. 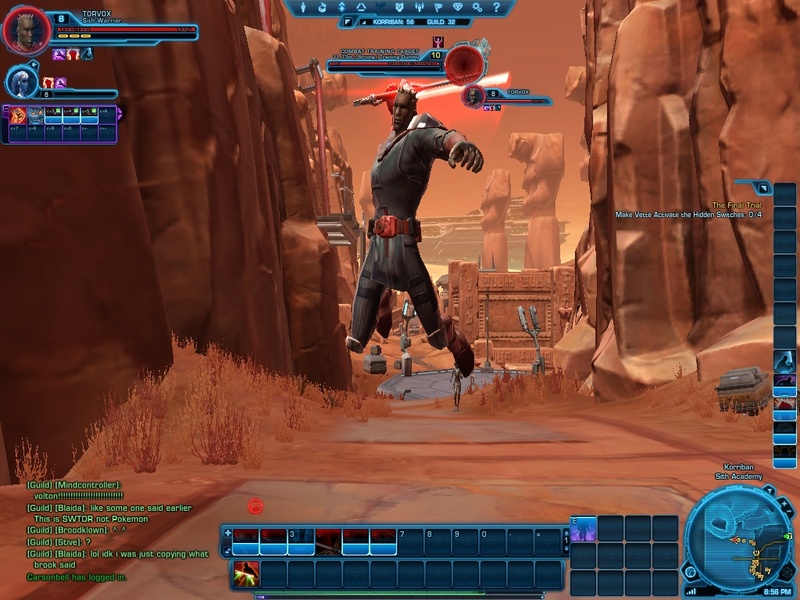 In fact, when I leveled my shadow I wouldn’t leave a planet until I had all the datacrons for it. Alderaan was difficult but stealth was my friend. 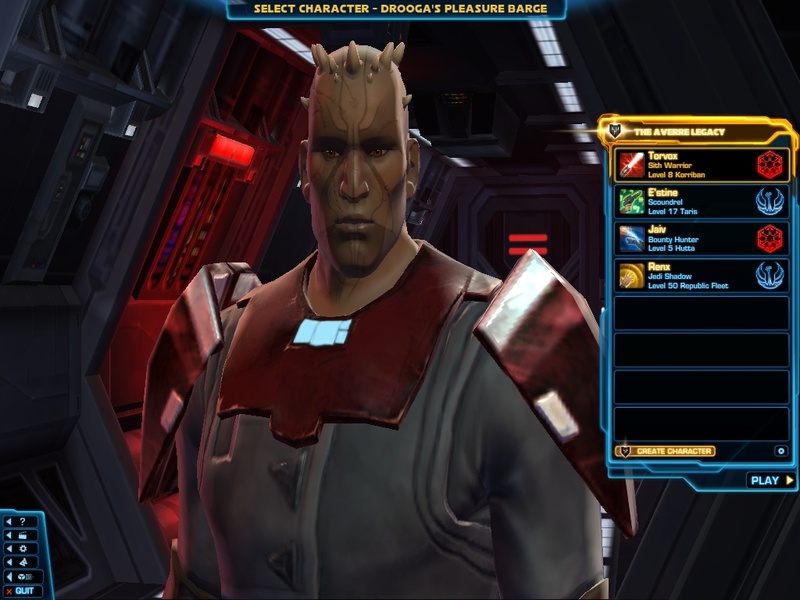 So after I finished gathering the three datacrons on Korriban I went to Hutta and got those three as well. Torvox the Juggernaut now sits on the Imperial fleet station ready for the next planet in his own saga. Torvox, an ADHD fanatical swordsm…it’s peanut butter jelly time! Video Suggestion: The Ultimate PvP Experience (Killing Your Friends! :D) New Server! New Fun!